From left: Paul Brar, Ya Rong (Ellen) Zheng and Adiel Mira trusted information, not intuition, to beat their opponents. Beating out companies from around the world to put yours on top is no easy task – but that’s exactly what three Commerce and Business students did last month. Ya Rong (Ellen) Zheng, Adiel Mira and Paul Brar – aka the G-Team from VanCity – are students in BUSN 2275, Business Strategy and Simulation. They beat 10 other teams in an intense two-week competition from institutions from around the world to win the Best-Strategy Invitational for May 2013 (the competition runs three times a year). In this online simulation – where 10 years of real-world time is condensed into two weeks – teams run an athletic shoe company and must come up with a competitive strategy to make their organization no. 1. The G-Team says their killer strategy included basing every decision on information rather than on intuition. “Collecting, sorting and analyzing data was a very long and tedious process, but our teamwork, motivation and hard work enabled us to succeed,” says Ellen. The competition was no cakewalk – after the fifth decision round the G-Team fell from first place to fourth, and they thought they’d never make it back on top. But they pulled together, trusted their numbers and never looked back. “We were back in first place for the last four decision rounds and had 11 percent more points than our nearest competitor,” Paul says. The BSI allows only students who have come at the top or close to the top of their class in the Business Strategy Game (BSG), an intense business simulation that forms an integral part of BUSN 2275, to compete against all other worldwide BSG winners for that semester. Is philosophy giving you fits? Is APA absolutely agonizing? If so, you may want to check out the Douglas College Learning Centre for help with your courses. 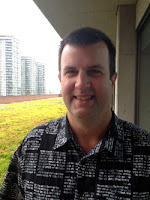 The Learning Centre (or the “LC,” as the cool kids call it) has branches at both the Coquitlam and New Westminster campuses offering free help for any course at the college. The LC uses a student-led approach to learning that puts you in the driver’s seat to help you succeed not only in current courses, but future ones as well. LC tutors are peer tutors; they are students just like you, taking classes at Douglas or other post-secondary institutions. In addition to help with coursework, they can help you with essay writing, math skills and computer problems. Plus they can coach you on how to study more effectively. If you are having troubles in a course, don’t wait until it’s too late! From the LC homepage you can log into WCOnline and find a time that’s right for you for a 25-minute appointment. Bookings can be done 24 hours a day, so there’s no need to hesitate. All Learning Centre tutoring is FREE to Douglas College students. You can also apply for a weekly, ongoing hour-long session with a tutor. One more option is to send your written assignments to an online tutor; you can send in your written work any time, seven days a week. Getting help is as easy as going to our website and choosing the option that works best for you. When Glauce Fleury decided to leave Brazil to pursue a writing diploma in Canada, many people told her she’d never make it. “They said I would always be competing against Canadians or other native English speakers and wouldn’t have a chance,” Glauce recalls. 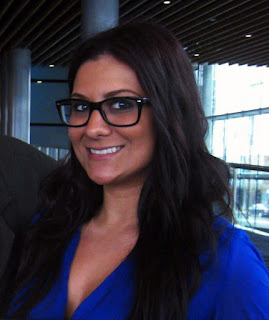 But the pull of her dream and living abroad was too strong, and soon she found herself at Douglas College taking the Print Futures: Professional Writing program – and proving the naysayers wrong. After her first year in the two-year program, Glauce landed a communications internship at the David Suzuki Foundation. 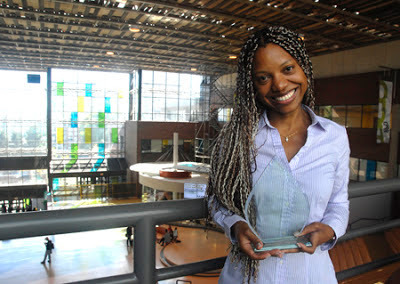 What’s more, she recently received the Student Communicator of the Year Award of Excellence from the International Association of Business Communicators (B.C. branch), a network of more than 600 communications professionals from across the province. She received the award for a 68-page manual for international students at Douglas College she designed and co-wrote with a classmate. “I am really proud of having written that manual, regardless of the award,” Glauce says. The manual was an assignment for one of her Print Futures classes, though she treated it as anything but. A trained journalist, Glauce put the same amount of care and work into it as she would with a “real” job. “I knew it wasn’t going to be perfect, but it had to be my perfect,” she says. Glauce’s journey hasn’t been easy. Besides taking on the task of learning how to write professionally in another language – no mean feat – she is also the only international student in year one of her program. But she says receiving the award has made it all worth it. “English is not my first language, so it means so much to me,” she says. If you think your dream job is just a faint light at the end of a long tunnel, Mackenzie Lister - the latest recipient of the Douglas College Student Excellence Award - has news for you. Mackenzie is an emergency nurse at Royal Columbian Hospital. 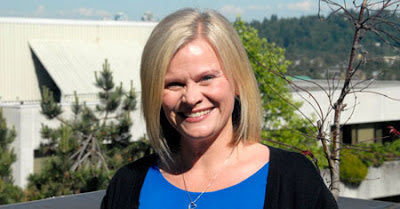 She’s also a forensic nurse examiner at Surrey Memorial Emergency, which means she cares for victims of trauma from sexual assault, child abuse, human trafficking, elder abuse and more. She also collects forensic evidence, consults with legal authorities and presents her findings in court. While a student at Douglas, Mackenzie collaborated with one of her instructors to write the new curriculum for Douglas College's revised Bachelor of Science in Nursing program. She says the program prepared her well for what she's doing now. 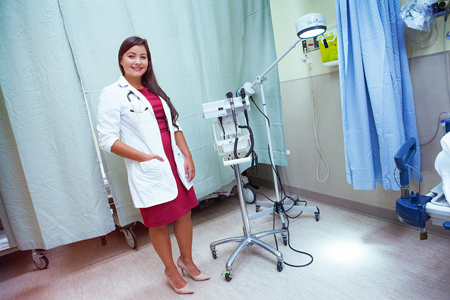 "The educators in the BSN program are tremendously talented in their own right," she says. "To have been mentored by some of them was a privilege." Looking to take your learning to a whole new country? Consider going on one of our fields schools next spring! When King Albaña attended the Douglas College Scotland field school, in Edinburgh, he discovered that sometimes the best places to learn are outside the classroom. 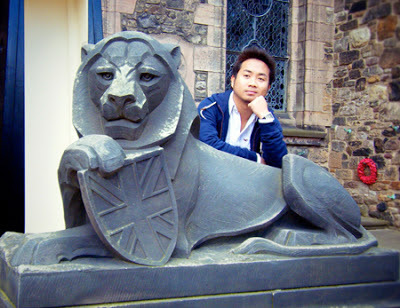 He studied geography on top of the majestic summit of Arthur’s Seat, learned about performing and fine arts through visits to theatres, museums, galleries and castles, and studied creative writing in the city where J.K. Rowling wrote her Harry Potter series. He even visited the café where Rowling first began writing the novels. To find out more about our field schools, visit Student Planet on our website. Expand your horizons - take courses in social work! Interested in taking courses in social work? For the second year running, the Community Social Service Work (CSSW) Program is offering two courses to all Douglas students (so you can take them even if you are not a CSSW student). This is a terrific way for you to get acquainted with the field of social work and earn university transfer credits at the same time. Introduction to Social Welfare (CSSW 1200) will be offered in Fall 2013, and Introduction to Social Work Practice (CSSW 1100) will be offered in Winter 2014. Both courses are hybrids, which means you get the flexibility of continuing your studies while keeping up with other commitments, such as work and family. You’ll spend half the time on campus as you would with a traditional class. The rest of the time is yours - you can work on quizzes, chat room discussions, multimedia presentations and other assignments at your convenience. Introduction to Social Welfare deals with income security measures in Canada, while Introduction to Social Work Practice provides an overview of social work as a profession. Social Work Practice covers issues such as homelessness, poverty, immigration, aboriginal issues, mental health and other topics relevant to the profession. “These courses provided me with an interesting look at the past and current developments of social work over time,” says Jennifer, a recent student. “I had no idea of the relationship between political movements and the development of social programs that seem just a part of our lives,” says Tom, a current grad. The courses require no prerequisites, and credits earned can be transferred to most Bachelor of Social Work Programs offered in British Columbia, including those at UVic, UBC, UNBC and other institutions. David, a grad who is already employed in the field of social services, says these hybrid courses allowed him to work full time and still complete what he needed to further his career in social work. “I’ve been working at an agency for a while now, but having these courses gives me more security in my position and allows me to pursue more schooling down the road,” David says. Linda, an Arts and Humanities student, says she likes the hybrid format because it required her to stay on top of her studies. Find out more about the Community Social Service Work Program on our website. Graduation. It’s not an ending, but a beginning. At Douglas, we’re proud to be a part of so many amazing beginnings, like those we celebrated this week at our Summer 2013 Graduation ceremonies. We know that every student has a great story, so we’d like share those of some of our valedictorians as they head off to do what they love. After trying her hand at various disciplines, taking post-secondary courses and volunteering at community-based organizations, Shayna Dolan found her calling. “I quickly realized I was passionate about working with people at the community level,” she says. Shayna found her way to the Therapeutic Recreation program at Douglas and quickly distinguished herself as a model student and citizen. In addition to the work she put in for her degree, she took part in the 2012 Uganda Project, completing a 10-week practicum in Masaka. “Seeing the empowering relationships Douglas College has helped to facilitate reinforced the importance of responsible and sustainable community development,” she says. 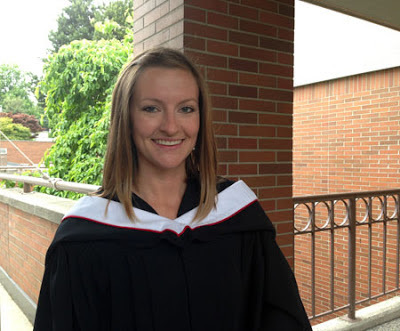 After finishing her degree in Therapeutic Recreation, Shayna decided to continue her studies at the University of Northern British Columbia, where she will pursue a master’s degree in Community Health Sciences. 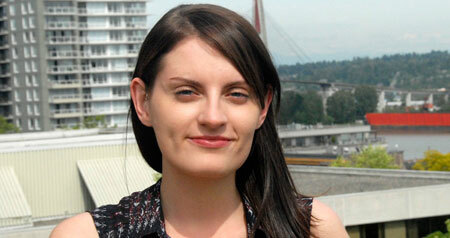 She plans to focus on health policy, education and research in rural, remote and First Nations communities. “It’s a dream come true," Shayna says. When Mea Jyn first came to Douglas, she didn’t believe in herself one hundred percent. Now she is living proof of Douglas’s motto: “Do what you love. 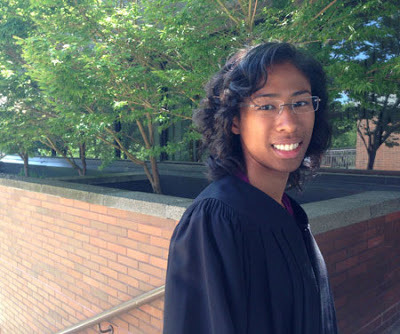 Be good at it.” "I wasn't confident in my ability to succeed in math and science courses," she says. "But every step of the way I met a teacher who inspired me to challenge my own preconceptions and perceived limitations." Mea isn't leaving Douglas just yet. She's been accepted into the third year of the Bachelor of Physical Education and Coaching program. Her goal is to teach, inspire, learn, grow and support others in their journey to do the same. "The best way I can do that is through living by example," she says, "If I can be true to myself, I can help others be true to themselves." "Shocked" at being chosen as valedictorian, Mea says she is grateful for each and every moment that has brought her to this point. "I am a firm believer that you are the creator of your own destiny and that your thoughts and beliefs shape your relationship with yourself and others," she says. "If you stay present and are truly grateful for the rewards and the obstacles that cross your path, you will find value and opportunity to grow in every experience." Jeff is now planning to move to another institution to complete his degree, with the ultimate goal of becoming a music teacher. “Douglas College’s Music department’s faculty and staff were a major part of taking what was once a hobby and turning it into a lifelong career,” he says. If Rachel Tomson had to narrow down her most memorable experiences at Douglas, they would be participating in the 2009 Uganda Project, where she did a 10-week practicum in Uganda, and being selected as valedictorian. "Both opportunities have completely blown me away," she says. "Before beginning my educational career at Douglas, I never thought I was worthy of the type of success which would present me with these types of opportunities." Rachel says studying at Douglas and being part of its "supportive academic community" has taught her to believe in herself and always strive for new levels of greatness. "The small class sizes, wise and experienced instructors, and unique opportunities to experience learning in a real and practical way has helped me to succeed," she says. Now that she's graduated, Rachel is looking forward to working in social services and getting a masters of counselling psychology degree. Her goal is to work in the area of child and youth mental health. "I absolutely believe in and embrace Douglas's motto, 'Do what you love, be good at it,' she says. "I think this motto inspires people to follow their dreams and believe in themselves - at least it did for me!" 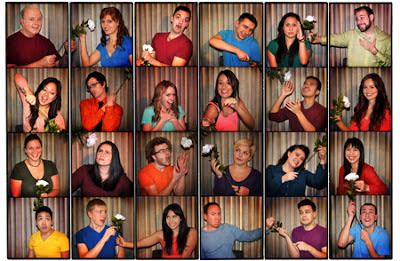 The first cohort of the Bachelor of Performing Arts Degree program graduated Monday at Capilano University. Offered jointly by Douglas College, Capilano, Langara and Vancouver Community College, the BPA is a nine-month degree-completion program for fourth-year students. The program was designed for students and working professionals with a significant background in dance, music, film arts, stagecraft, theatre, arts and entertainment management, musical theatre or digital media, and focuses on collaboration, entrepreneurship and creative development. Read more about the program in a story by the North Shore News, or visit our website. 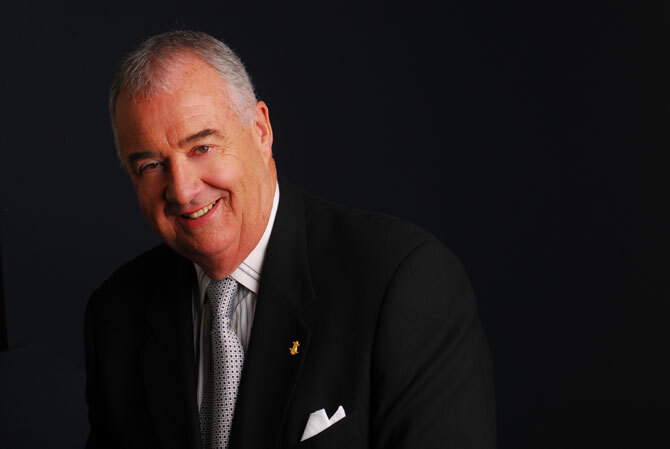 Douglas College will award business and community leader Peter Legge with the College’s highest distinction today – Honorary Fellowship. Legge is CEO of Canada Wide Media, Western Canada’s biggest independent publishing company. He is an honorary member of the Douglas College Foundation Board, a donor to the college and has lent his name, expertise and influence to the Peter Legge International Institute for Sales Excellence at Douglas College. Legge has raised millions of dollars for a variety of community causes, particularly through his work with Variety – The Children’s Charity. He has been a director of the Variety Club Telethon for 20 years and co-host for 35 years. He is also Variety’s International Vice-President. As an inspirational speaker, Legge is renowned in North America and is the only Canadian in the prestigious Speakers Roundtable. He has won numerous awards for his inspirational and motivational talks. Legge accepts his award today during a summer graduation ceremony at the New Westminster Campus. Douglas College will honour entrepreneur philanthropist Frank Giustra tomorrow as one of the College’s most distinguished alumni. Giustra graduated from Douglas College in 1979. 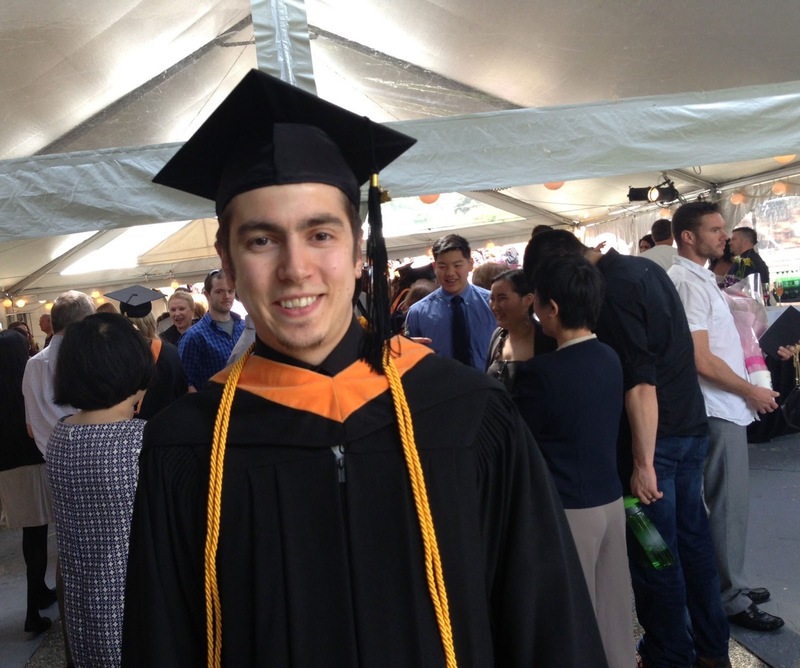 He began at Douglas in the Music program before switching to business and finance. He has since become a successful stockbroker, mining financier and Founder of Lions Gate Entertainment. Currently, Giustra is President and CEO of Fiore Financial Corporation. Giustra says receiving the award was a bit of a surprise. A prominent philanthropist, Giustra donates a substantial percentage of his profits to charity. As Founder and Chair of the Clinton Giustra Enterprise Partnership, he works with former U.S. president Bill Clinton to create social and economic programs to combat poverty in developing countries. Closer to home, Giustra is the Director of Streetohome Foundation, whose mission is to end homelessness in Vancouver by providing secure, affordable housing to chronically homeless people. He also mentors disadvantaged kids through a group called The Boys Club. Giustra says the recipe for a successful and happy life contains two ingredients: passion and conviction. 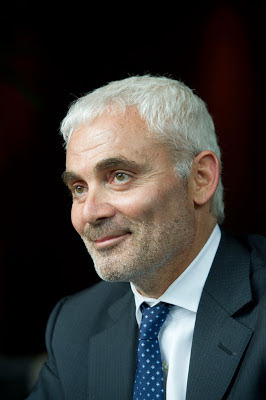 Giustra also says he has no regrets about any of the decisions he’s made throughout his career – good or bad. Giustra’s schedule did not permit him to be present at tomorrow’s graduation ceremony. However, he was able to provide a video address to students. Check it out on the Douglas College YouTube channel.